until they know know they are getting a straight story, forthcoming advice, accurate data and unfiltered facts. Public officials in Wisconsin who continue to move the Foxconn deal forward without these fundamental assurances would do so in flagrant disregard of significant disclosures in Thursday's Milwaukee Journal Sentinel that throw into doubt the validity of Walker's varying claims the deal will create 13,000, or up to 13,000 jobs. It is the key round number repeated through the process which underpins the entire, precedent-setting $3 billion subsidy-and-environmental waiver-laden package for Foxconn and which helped move it through the Assembly. On Thursday, an older version of a previously released state report surfaced...The report by consulting firm Baker Tilly Virchow Krause was paid for by the Wisconsin Economic Development Corp., which had previously denied an open records request by the Milwaukee Journal Sentinel for the document by saying it was a draft. The document reports the plant would create a maximum of 8,260 jobs rather than 13,000. Now stop right there. So is it 13,000 jobs or 8,260 jobs? How, when and why the difference? And why didn't the WEDC respond in a timely fashion under state law for a document paid for by taxpayers? Was it because the report contained the much smaller jobs projection and therefore projected a much smaller per-job public taxpayer subsidy - - a basic question central to the wisdom of the entire deal? The study also projects that a larger share of the jobs building and running the plant would go to out-of-state workers. Baker Tilly changed those assumptions and findings in a newer version of the report that was released to the Journal Sentinel on Monday. WEDC spokesman Mark Maley said the nearly 5,000 additional workers in the new report were due to Foxconn increasing its hiring plans. Maley would not say whether that was due to changes in the company's plans for the factory or because the state had offered more incentives. You cannot overstate the important of these disclosures, nor overstate the need for complete clarity and unvarnished information from Walker and his administration before another affirmative for Foxconn is taken. The Joint Finance Committee meets for a Foxconn hearing on Tuesday in Sturtevant at 11 a.m. at the SC Johnson iMET Center at 2320 Renaissance Blvd. Regrettably the committee does not take sworn testimony, but every state official who had a hand in the report should be compelled to answer questions as the lead-off witnesses, and every private sector individual who participated in this process should be strongly encouraged to speak. Brad D. Schimel‏ @BradSchimel Jul 27 Workers succeed and the economy thrives when we value individual freedom and opportunity above over-regulation and big government. 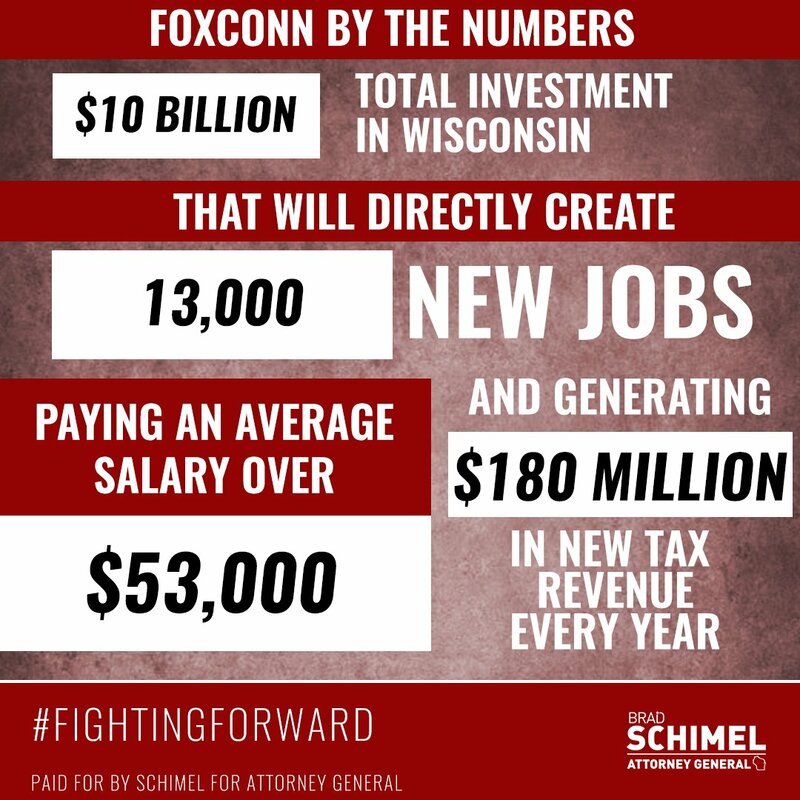 Scott Walker‏Verified account @ScottWalker Jul 26More Foxconn is bringing 13,000 high-tech jobs to Wisconsin -- the biggest jobs announcement in our state’s history!